On todays card, I started with the Peach Card stock and ran it through my Big Shot with the DOTS Embossing Folder. I adhered it to a strip of Black Card stock. I used the Italian Flourish Doily from Cheery Lynn Designs cut in the Layering Swatches #2 Deep variety- Black. I cut the Italian Flourish Doily in half using my Paper Trimmer and used the Quickie Glue Pen to adhere it to the 5 1/2" x 8 1/2" Vanilla Cardstock. I used the Fanciful Flourish Die from Cheery Lynn Dies with Olive Cardstock and adhered it using the Quickie Glue Pen. I then added the Peach and Black Panel and adhered the Tea Rose Latte Mulberry Roses with Glue Dots. I wrapped the Eggshell Seam Binding around and tied a bow to finish off the embellishments. Once everything was pieced together and adhered, I stamped the sentiment from the Topsy Turvy Cakes Stamp Set from JustRite Stamps. This card was a QUICK card to make and I love how the Italian Flourish Doily and Tea Rose Latte Mulberry Roses jazzes it up! Thank you for taking a look today! Have a blessed day! Hello Everyone!!! 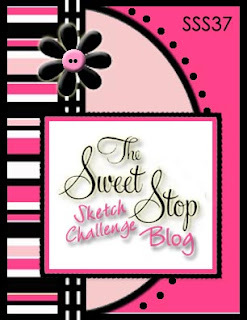 Welcome to the Sweet Stop Sketch this week! The Sweet Stop Sketch is celebrating their 3rd Birthday this month! We hope you have been enjoying our Anniversary Month!!! To make it a SWEET celebration, throughout April we are going to have fun with past sketches, and will be giving away prizes every week. Each of the Design Team Members picked our favorite sketches to use this week. You can choose to either use one of the sketches we used, or you could choose from all of the past sketches (found HERE). Please include the sketch you chose to use (or a direct link to the sketch) in your blog post. One lucky participant will win a $15 Gift Certificate to the Sweet'n Sassy Store. For my project, I used the brand new images from Susana's Custom Art and Card Design from Elisabeth Bell called Summertime Peekers, you can purchase them in the group or you can get them individually. This cute image is called Slice of Life Peeker. Isn't she a cutie pie??? Susana had a blog hop yesterday and you can see more details HERE. When you are done looking here, please take some time to be inspired by the Sugar Babies creations: Cathy McCauley, Monika Davis, Janice Melton, Shannon White, Shelby Goolsby, and Wendy Ramlakhan. Hello Everyone! Today, I have a LONG post with lots of information! Susana's Custom Art and Card Design has a NEW release and a SPECIAL BLOG HOP! On my project today, I started with white cardstock and laid the Glimmer Screen called Seaside On the Beach over and sprayed the Dylusions Pure Sunshine Ink Spray. I then stamped the Unity Stamp - Painted Punchinella in Teal Ink onto some Bermuda Bay cardstock. I laid the Seaside On the Beach Glimmer Screen over it and using the Faber- Castell Gelato in White, I rubbed in around with my finger in the grooves over the Glimmer Screen to frame the tree stencil. I recently found out about these Gelatos and have been playing with them all week! I love the versatility of these. You can rub them in with your finger or a sponge, or use a water color brush or even just a spray bottle! Susana has a variety of colors for your crafting needs HERE! I stamped the adorable Seashell Peeker in Black Staz On ink and used the following Inspiration Paints - Sunshine, Autumn Wheat lightly brushed over Blush water based Ink for the skin ton, Garnet for the lips, Raw Sienna and Carmel for the hair. For the blue, I mixed the Tanzanite, Sky Blue and Olive Green to create the shade of blue to match the card stock. I used Tutu Pink and Blush for the flowers. The shell was painted by dabbing Raw Sienna, Blush and the remaining blue mixture. The sand was painted with Autumn Wheat and Raw Sienna. Once I had this cutie all painted up, I fussy cut her out with my paper snips. To create a little texture in the sand, I added a small amount of Gold Viva Pearl Pen. To finish off the card, I added a small border with Lacey trim. Susana has added LOTS of new product to her store. You can see the NEW line called The Eyes of Beauty and Dreams- HERE!!! Lots of FUN new mixed media stamps, Donna Salazar-Tim Holtz-Christy Tomlinson/She-Art-Inkadinkadoo-etc.- HERE!!! New Frantage Color Fragments and Embossing Enamels-HERE!!! Lots of fun new pins- HERE!!! New 6x6 paper pads- HERE!!! New Memory Box and Poppy Stamp Dies- HERE!!! Also the ShinHan Art Touch Twin Marker sets are back in stock- HERE!!! I am not part of the HOP today, but please take some time to check out these CUTIES and BEAUTIES that the talented team has designed for your Inspiration and viewing pleasure!!!! I know this was a long post and I appreciate you taking the time to look and hope you enjoyed my project today! I hope you have a FABULOUS weekend!!! Welcome to Technique Junkies Mini Album Mania CD Blog Hop! Come join the fun!!! Did you come from Shelly's blog? (If you didn't arrive here from the Technique Junkie blog, you don't want to miss what our whole DT has in store for you! )The Blog Hop starts HERE. The winner will be randomly chosen from commenting hoppers and will be posted on Pat’s blog the following week (not sure what day….) The prize will be the Mini ALbum Mania Cd! What a great prize!!! Let me know which of the cd's that we have created so far is your favorite! This CD is a Pictorial PDF form of cds - and EASY to understand! I love it!!! So many cool techniques! You can order your copy of the cd here!!! From here you will definitely want to go see what Holly created for us! She has such a clean and gorgeous style! I am always inspired by her creations! If you should get lost along the way on the hop, here is the entire list! I hope you all enjoyed my project today! Thank you for stopping by! Enjoy the hop! Hello Everyone! I hope you are enjoying your weekend! This week Classy Cards 'n Such is challenging you to make a 3-D Project! For my project I created a Goodie Purse using the Technique Junkie Newsletter 3-D and Fun Folds Cd! This little purse is so fun to make and decorate. It would be a perfect inexpensive gift to fill with lip gloss, nail polish, candy or even a gift card or cash! I started the purse by using the Teresa Collins 6x6 Patterned Paper called Spring Fling. Classy Cards 'n Such has a BEAUTIFUL array of Patterned Papers for you to design with! The words I used on my project come from the Just Rite Stamp set called Topsy Turvy Cakes. To create the cute little flower, I used the Miniature Rose Die from Cheery Lynn Designs along with the Paper Blossoms Tool Kit to help curl the flower blossoms. To adhere all of the little blossoms together, I used the Sakura Quickie Glue Pen. To finish the flower off, I added the Viva Pearl Pen Ice White on the internal portion of the flower and around the scallop punch layer to decorate the words a bit. To further embellish this cute little purse, I added a bow using the Red and Green Doodle Twine - Christmas Assortment. To create this little Goodie Purse I used the Technique Junkie Newsletter from the 3-D and Fun Folds Cd. Have you purchased your 3-D and Fun Folds Cd yet? This brand new CD has 70 tutorials for gifts, decorations, boxes, cards, and much more! the original Fancy Folds and Motion CD was so popular, we just had to create MORE for you. All of the tutorials are in step-by-step PDF pictorial format -- and are printable to 8-1/2" x 11" paper. We even have an index with thumbnails on this CD to help you find a project quickly and easily! I hope you will join us in the 3-D Challenge! Come back tomorrow for a VERY special Blog Hop with the Technique Junkie Newsletter! Have a wonderful day! Hello Friends! Happy Saturday! Welcome to the Sweet Stop Sketch this week! The Sweet Stop Sketch is celebrating their 3rd Birthday this month! To make it a SWEET celebration, throughout April we are going to have fun with past sketches, and will be giving away prizes every week. For todays card, I thought it would be fun to make a Rosette. I took white strip of card stock and stamped the Dogwood Branch image from DRS Designs in Pretty in Pink, Rose Red and Regal Rose Inks. Then I created the Rosette. I stamped the same Dogwood image on the background of the Pink Pirhouette card stock. I ran white card stock through the Polka Dots Embossing folder and sponged it with Pretty In Pink ink. I then took white cardstock and stamped the Good Courage Greeting in Rose Red Ink and wiped the ink pad across to add a little color. I added some Saffron and Rose Red Layers and tied a yellow satin ribbon around to tie a bow. HELLO FRIENDS! Happy HUMP Day! I hope your week is going well! This week over at DRS Designs, we have been challenging you to make a GIFT CARD holder! On todays project, I used some new images called a Gothic Gift Card, Congrats Address Frame and the Easy Dot Background. I used the POLKS DOTS Cuttlebug folder with my Big Shot and colored up the images with the Real Red, Green Galore, Yoyo Yellow and Garden Green Markers. I wrapped a red stitched ribbon around the card and mounted the Address Frame on Dimensionals to pop it up! I hope the rest of your day is FANTASTIC!!! Thank you for stopping by! Hello Friends, With the warmer weather peeking through here and there, I am finding I have SPRING FEVER! I am enjoying seeing the grass turn greener and flowers bloom. What better time than to pull out some Floral Stamps and Floral Embellishments? On todays project, I used the Technique Junkie Newsletter and the technique called Colorful Stripes. This project does not use ANY patterned paper, it is ALL hand stamped using the beautiful images available at Classy Cards & Such.called JustRite Designs Botanical Butterflies. I stamped the focal image in Brown Memento Ink and colored with Copic Markers on Cryogen White Cardstock. Once colored, I used the Viva Pearl Pen in Gold to fill in the center of the flowers. Using a 1 1/4" Circle Punch and a 1 1/2" circle punch, I layered the image on a Scallop punched layer using Bazzil card stock. I adhered the layers together using the Joy! Foam Pads, small. Using Green Coredinations, I used the Cheery Lynn Designs die cut called Fanciful Flourish. A few tools I used to make this job a little easier while using the die cutting machine is the Crafters Tools by Cheery Lynn Designs, Sakura Quickie Glue Pen, and the Cuttlehug, Small by Cheery Lynn Designs. I find the tools so helpful in moving, molding die cuts, while the Cuttlehug helps eliminate the need for addition paper shims. The Quickie Glue Pen is a wonderful adhesive that works great on dies with a lot of details and small areas. To finish the card, I added Robins Nest Tear Drops and White Organdy Ribbon to tie a bow. I hope you enjoyed my project today! Have a wonderful day!!! Happy Saturday sketch lovin' friends!!! The Sweet Stop is celebrating it's 3rd birthday this month. To make it a SWEET celebration, throughout April we are going to have fun with past sketches, and will be giving away prizes every week. Thank you for stopping by! I hope you have a wonderful weekend!!! 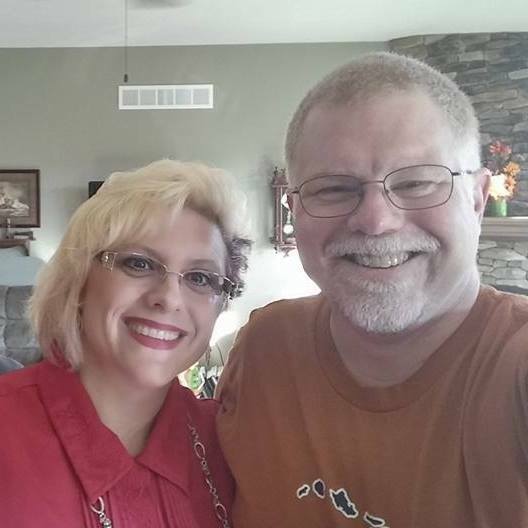 I'm a day early with a very special birthday surprise....tomorrow is my dear friend Korin Sutherland's birthday! A group of her friends are getting together today for a fun early birthday party, since tomorrow is the fantastic April Release Blog Hop for Sweet 'n Sassy Stamps, and we didn't want to take the spotlight from that. After all, our sweet girl deserves her OWN day in the spotlight! So please join us as we celebrate Korin's birthday a little early! After all - you can never have too much celebration, can you?!?! Below is the whole birthday party train....prepare yourself for some fantastic cupcakes and ice cream from these talented ladies!! And feel free to leave Korin some early birthday love, either on her blog, her Facebook page, or the Sweet 'n Sassy Stamps Facebook page! Thank you for stopping by! Wishing Korin a VERY blessed birthday!!! I have two blog posts today! Scroll down one to see the other for DRS Designs! Hello Friends! Today I am sharing a project using the fabulous designs from DRS Designs! I started by embossing a pirhuoette pink card stock in Secret Garden Embossing folder and layered it on white card stock and Rose Red Card stock. I stamped the Broken Flower Fence in Memento Brown ink and colored it with my Prismacolor Pencils and Gamsol. I stamped the Extending Sympathy Greeting in black Memento Ink in the upper portion of the white card stock. I used the Corner Punch and the Cheery Lynn Designs Fanciful Flourish Die on the side. To finish it off, I added some Dew Drops with Mini Glue Dots. Thanks for taking a look! Have a blessed Easter!